It’s July and the biggest fireworks are happening on stages around town. Below, BroadwayBox editor Josh Ferri picks the 10 plays, musicals and concerts you should check out this month in New York City. 1. Soon the time will come and the world will be separated into two kinds of people, those that saw Brandy Norwood in Chicago and those who didn’t….make sure you’re in the first grouping. She is EVERYTHING—the vocals will take you to church, the acting is on point, and when she stands in the spotlight, she just emanates old-fashioned star quality—and she’s got a killer featured cast backing her up, including NaTasha Yvette Williams whose Mama Morton drives audiences absolutely wild. That’s why, this July, the hottest show in New York and our show of the month is the long-running hit Chicago. 2. If you aren’t afraid to venture outside of Times Square, the rewards of Naked Angels & The Lobbyists new downtown musical SeaWife are plentiful. It’s rocking the house down at the South Street Seaport Museum with absolutely gorgeous music and an insanely talented young cast that all play their own instruments. Imagine a nautical Once but without all the Czech baggage. 3. This month’s third spot goes to three Broadway replacement castings so exciting they’re worth a revisit to the respective shows. Australian treasure Anthony Warlow is going into Finding Neverland; the gorgeous-voiced Judy Blazer is playing the shifty Miss Shingle in the Tony-winning Gentleman’s Guide; [PS: Totally worth a revisit to see the entire replacement cast—star Jeff Kready is genius!] and Jose Llana makes the jump from Lun Tha to the King of Siam in LCT’s Tony-winning The King and I revival beginning July 14. 5. 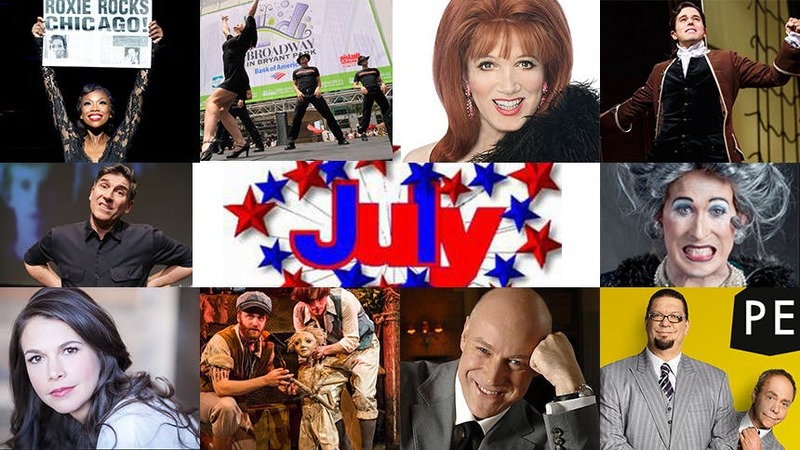 Get yourself over to Bryant Park one Thursday lunch hour this month to see all your favorite stars (or beloved understudies) perform in 106.7 LITE FM's Broadway in Bryant Park. Check out the schedule here to plan which days you’re going to sing along or record a YouTube theatre lovers will enjoy for years and years to come. 6. James Lecesne’s The Absolute Brightness of Leonard Pelkey begins its limited 12-week run at the Westside Theatre on July 11, and the buzz from the one-man-show’s first sold-out run was off the hook. The story is about a flamboyant 14-year-old boy who goes missing in a small Jersey shore town, and Lecesne plays everyone of the town’s inhabitants. 7. As far as the concert/cabaret scene goes, these are your three best bets. The legendary Charles Busch returns to 54 Below with his brand-new show That Boy/That Girl (July 14-17 & 23), and if you like to laugh at smart comedy, look no further. Tony nominee Liz Callaway (Baby, Miss Saigon) performs For the Record, a one-night-only concert of songs she’s always wanted to record, at the Metropolitan Room on July 28. And over at Joe’s Pub, you MUST check out the reunion of imaginary ‘90s R&B girl group 2Scoops on July 18; it’s everything you love about the ‘90s but with the comedy of today. 8. Honestly, I’m still confused as to what Mrs. Smith’s Broadway Cat-Tacular is exactly, but the photos are campy as hell and the video below is to die for; so why not take a risk, show up and laugh along with this “woman on the verge of a cat-based breakdown”? 9. World-famous magic duo Penn & Teller return to New York after a 25-year absence with a brand-new, family-friendly magic show at Broadway’s Marquis Theatre. Hurry over because this one-of-a-kind act is disappearing after six weeks. 10. The new Broadway musical Amazing Grace takes audiences on a journey from England to Africa and back again, introducing slaves, slave traders, African royalty and passionate abolitionists, and giving a new generation context to one of the world’s most enduring hymns. Just check out how positively epic the show’s commercial is. How can you resist?